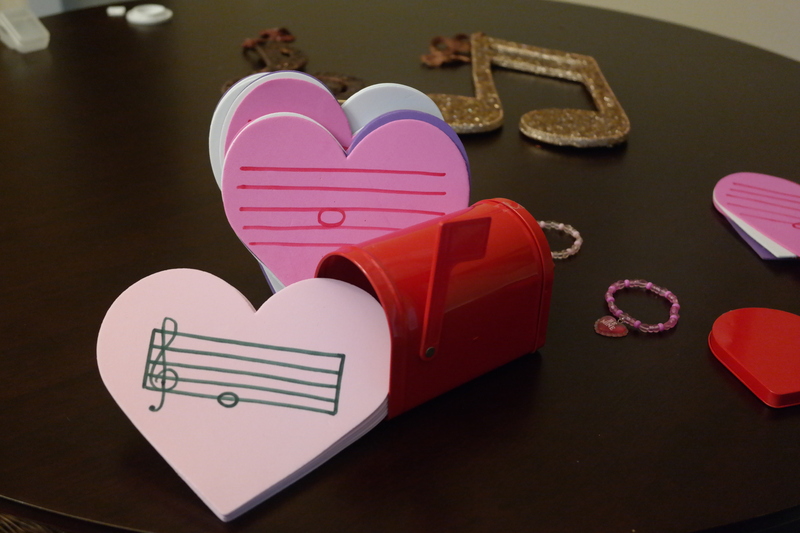 If you are looking for a quick, fun, and effective music theory activity with a Valentine’s Day theme to start or end your piano lesson you should definitely give this one a try! Click the video below to hear what one of my students said when I asked her the question…It will make you LAUGH! Pinterest Inspired – Music Heals Broken Hearts! Pinterest has got to be one of the greatest resources for inspiration that I’ve ever come across! While browsing the site recently I came across an activity from a school party that used broken hearts to review numbers that was pinned by Ann Berman. Someone suggested making a music matching game with this idea, so I did! I used it as a review for note and rest values. My 3 year old student LOVED it. The game was very easy to make. I used foam hearts and a sharpie to draw a quarter note, half note, whole note, and their corresponding rests on one half of each heart. On the other I wrote the number value. Then I cut the hearts down the middle in different shapes to make unique puzzles in order to make the activity self-correcting. Do you use Pinterest? If so, leave your link in a comment below. Then hop on over to my Pinterest page and check out some of my boards.